On Sunday, April 10, a day of Jewish pride was celebrated at the Mexico City Jewish Community Center (JCC). It was a day of joy and recognition for many of the Jewish institutions in Mexico that provide help and assistance to the Jewish community and to the country in general. Hadassah was one of the organizations recognized for its outstanding work. During the event, each institution showed a video that demonstrated its objectives, achievements, and activities. On multiple screens, simultaneous videos showed the personal testimonials of those who have been helped by each institution. Event attendees were greeted by the President of the Jewish Central Committee in Mexico, Salomon Achar and the President of the JCC, Mr. Rozen. At the conclusion of the event, a group photo was taken of the representatives of the various institutions, each displaying their well-deserved awards. 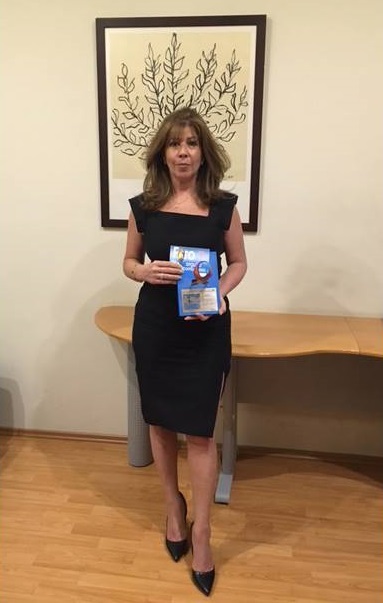 The Director of Hadassah Mexico, Ethel Fainstein, accepted the award for Hadassah Mexico. In an interview, she discussed the work of Hadassah International in Mexico as a non-governmental organization that supports the Hadassah Hospitals in Jerusalem. She explained that Hadassah International is supported by men and women of all religions and nationalities, and focuses on medical and scientific advances and cooperation that transcends politics, religion and borders. To promote medical and academic collaboration programs between the Hadassah Medical Center and the health ministry and health institutions in Mexico. To promote residency programs at Hadassah for Mexican doctors in the areas in which they choose to specialize. (To date more than 50 doctors have been trained at the Hadassah Hospital). To send Mexican doctors to Israel to study in Hadassah’s International Masters of Public Health (IMPH) program. More than 30 countries participate in this program each year. To provide information on the advances in medical research and technology at Hadassah. Currently 60% of the Medical Research in Israel is done at Hadassah. To present a positive image of Israel through its medical and humanitarian aid in mass casualty events around the world, most recently in Ecuador and Haiti. To present the Hadassah hospital in Jerusalem as a bridge to peace among nations that fosters an environment of coexistence through health and medicine. Hadassah Mexico is very proud to have received this award.